What is the Extended Ellett Line? The Extended Ellett Line is a project to measure and understand the ocean west of the UK. We are looking at how and why the currents, temperature and salinity have changed over the past few decades. We also investigate the impact those changes have on ecosystems and local climate. Each year UK marine scientists cross the deep ocean between Scotland and Iceland on a research ship. Along the way the scientists measure the velocity, temperature and salinity of the ocean; at points 30 km apart, the ship stops and instruments are lowered though the water all the way to the seafloor. Water samples are also collected and analysed for a range of chemicals (including iron, nutrients and carbon) and biological content (including phytoplankton). The project is one of a small number of high-quality, long-term marine data sets in the North Atlantic Ocean and helps us to understand changes in ocean climate. It is relevant to the UK and northwest Europe because the warm water flowing past the Extended Ellett Line keeps winters warmer than expected for this latitude. The history of the Extended Ellett Line began in 1948, when Jack R. Lumby of the Fisheries Laboratory in Lowestoft, UK, realised that use could be made of the regular passage of ships to the Ocean Weather Stations of the North Atlantic. These ships of opportunity collected underway measurements of sea surface temperature and salinity until 1996. 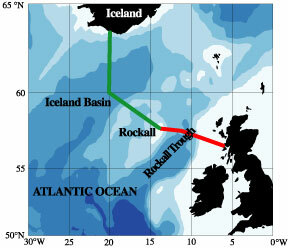 From 1975 to 1996, scientists concentrated on the Rockall Trough, measuring the warm salty subtropical water flowing northwards west of the UK and Ireland. Since 1996 the annual expeditions travel as far Iceland in order to measure all the warm water that flows into the Nordics Seas from the eastern North Atlantic. We also measure cold northern water flowing southwards at the bottom of the sea. 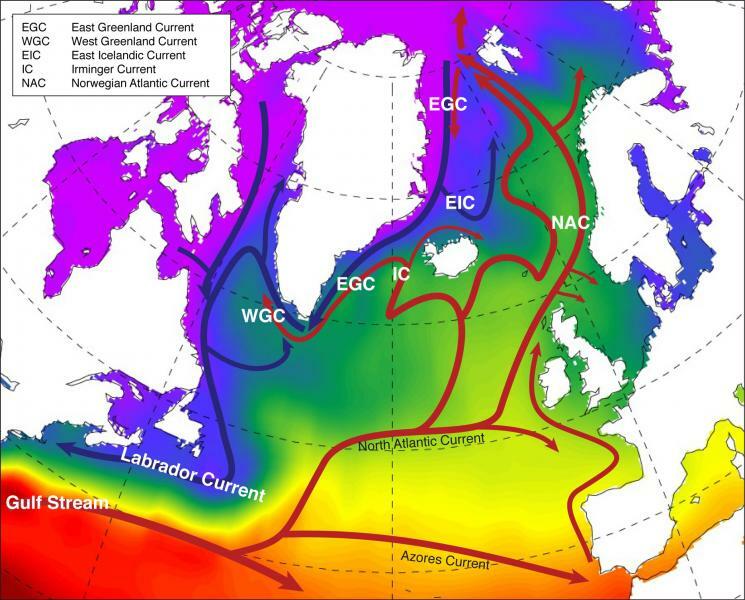 A key part of the global climate system is the Meridional Overturning Circulation (MOC), which carries heat and salt northwards in the upper layers of the Atlantic Ocean and cooler, fresher water southwards in the deep layers. In the subpolar region of the North Atlantic the northward transport takes places largely in the North Atlantic Current which travels through the Iceland Basin and Rockall Trough in a series of jets and eddy trains, continuing into the Nordic Seas and Arctic Ocean. The returning deep branches are made up of water cooled and freshened in the Arctic, the Nordic Seas and the subpolar North Atlantic itself. By making measurements on the Extended Ellett Line we can investigate the dynamics and variability of the northward-flowing warm saline water, including the interaction between the wind-driven cyclonic circulation of the subpolar gyre and the MOC. Around half of the returning dense water flows through the Iceland Basin, so by combining measurements from this region with partner programmes that capture the remaining dense flows, we can understand the key processes driving them. Conditions in the subpolar gyre are important for skillful decadal climate predictions, including the location of the Atlantic Inter-Tropical Convergence Zone and the number of tropical storms. Important climate impacts including rainfall in the African Sahel, Amazon, western Europe and parts of the US, are associated with subpolar gyre and North Atlantic variability. Present-day ocean and climate models are still unable to accurately represent the MOC in the subpolar region; only by understanding the physics of the system can we hope to improve the models. Changes in the physical conditions also profoundly affect the ecosystem of the region, from plankton to whales and birds. With changing conditions, key species change their feeding and breeding ranges, with subsequent impact on the health and exploitation of our seas. 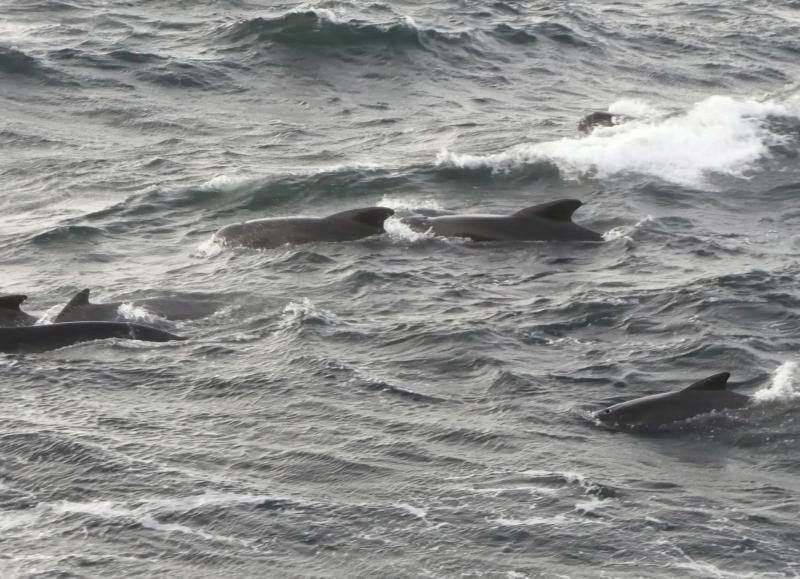 provide a long-term multidisciplinary ocean observation programme. The section was named after the man who started the hydrographic time series in the Rockall Trough in 1975. David James Ellett (born 22 July 1934) began his career in ocean science when he moved to the Lowestoft Fisheries Laboratory in January 1954 . Over the next decade he learned Atlantic hydrography by participation in wide-ranging cruises to the Barents Sea, North Sea, Irish Sea and Atlantic, including, notably, the ICES Faroe-Iceland Overflow Experiment of 1958. With long spells on both Irish and UK Weather Ships, this period also saw the beginnings of his life-long involvement with Ocean Weather Ships and their data. The Rockall Trough was to be David's main working area and interest to the end of his career, bringing a succession of new insights to what had so long been a data desert; the so-called "shadow of Europe". His collaboration with Dunstaffnage Marine Laboratory (Oban) began when he sailed with them aboard RRV "Challenger for the second ICES Overflow Survey in 1973. This led to his secondment in 1975 and ultimately to his transfer to Oban. 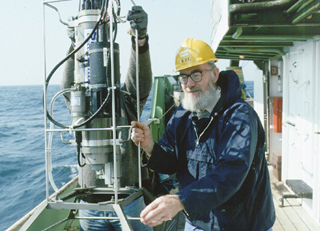 Until his official retirement in 1994, he thoroughly explored these waters, deploying the first long-term current-meter moorings in the Trough from 1975, planning then participating in the JASIN Air-Sea Interaction Experiment in 1978, recovering the first unequivocal evidence of a slope current west of Scotland in 1979, and making the first direct measurement of overflow crossing the Wyville-Thomson Ridge in 1987/1988.